The Postbox Shop offer an extensive range of post boxes and letter banks, to residential homes and commercial buildings. 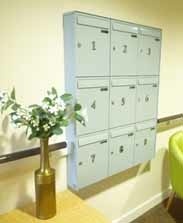 Our wall mounted post boxes are a great alternative, if you do not wish to receive post through your door letterbox. All security benefits and postal solution features are offered on our wall mounted post boxes. Features include a gasket seal to reduce noise and water penetration, engraving, an intercom system, video camera integration, a range of surroundings may also be selected and more. Individual and multiple wall mounted post boxes are manufactured for different style buildings, all able to hold A4 sized post. With so many post box styles available, such as door panel, through the wall, recessed, free standing and more, our wall mounted post boxes are great for both indoors and outdoors, depending on the architecture and size of a building.